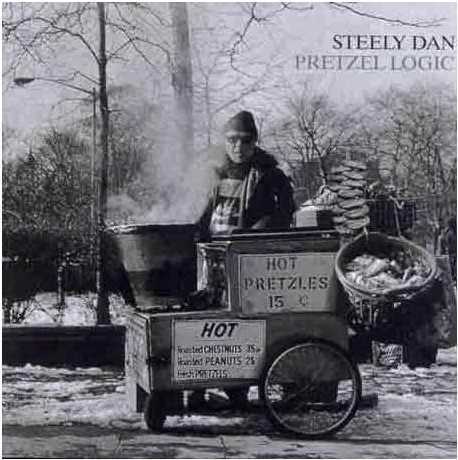 Steely Dan - "Pretzel logic"
This is not the first time a Steely Dan album gets reviewed. Exactly one year ago I reviewed Two against nature, one of their latest albums. Moreover, Steely Dan's albums get cited frequently on audiophile forums and websites because of the quality of the recording. An audiophile "must-have" is, for example, "The nightfly", one of the most famous Donald fagen's solo albums and one of the very first LPs (at that time) pressed out of a digital master. I'm a big Steely Dan fan and NOT because their albums sound good on any HiFi system. No, I mainly love their Music. One of my favourite albums is this "Pretzel logic" I'm about to write. It is their 3rd one, that dates back to 1974. Produced by Gary Katz, recorded by Roger Nichols this album contains the hit single "Rikki don't lose that number" which became the band's biggest hit, reaching #4 on the charts right after the release of the album. Pretzel logic also includes a Duke Ellington's cover (East St. Louis Toodle-oo) and a tribute to saxophonist Charlie Parker (Parker's band). The album has been placed, in 2003, at #385 on Rolling Stone magazine's list of the 500 greatest albums of all time. For sure, Pretzel logic was a unique beast when it hit the record stores. Back in 1974 it was impossible to listen to something similar. It was an incredibly fresh mixture of pop, jazz and rock, with lyrics so strange that it was/is sometimes hard to understand the whole meaning of the song (hence the title "Pretzel logic", I assume!!!). While their first two albums were mostly rock-oriented and -inspired, this "Pretzel logic" has a more jazzy taste. Nonetheless it lacks the somewhat cold atmosphere of the subsequent Becker & Fagen albums: perfect in every detail, food for mind more than food for soul. Don't get me wrong: I simply love all their albums but some of their juvenile freshness has started to lack after Pretzel logic was released. This might be caused by the decision to stop live performances (they stopped touring after Pretzel logic) but, in some sense, the duo started to talk more to the mind than to the heart. The reason why I've decided to include Pretzel logic into our list of audiophile recordings is simple: this album, besides being an excellent recording considering it dates back to 1974, is a good test for any system that aims to reproduce a lively swing. If your system is not adequate in the "timing" department then this album would sound boring and lifeless. Try following the simple rhythm of the title track or of "Barrytown" (my two faves): you shouldn't be able to stop your feet from stomping! These tracks are groovy to the n-th power! The bass lines of the title track - doubled by Jeff Porcaro's powerful drumming - are purely sensual, they are simple but extremely powerful and SHOULD be easy to follow, during the whole track. If they get lost among the rest of the instruments, something in your system needs a reality check. The same applies to "Barrytown", a song that possesses a joyous pace that should be naturally reproduced by your system. The song is only apparently simple: try to follow the patterns of the keywords and of the electric guitar...they are quite intricated indeed! Try to follow each one separately. Is it easy or confusing? [Answer: it should be EASY]. Another song with an urge is "Monkey in your soul": again PRaT ability of the system is under severe test here! On the other hand, the slow rhythm of the hit "Rikki don't lose that number" sounds a bit a-la Joe Jackson if I may ...only years before Joe published his first album! Its opening keyboard riff, directly taken from '64 Horace Silver's "Song for my father", is extremely catchy and involving, the system should preserve its slow and almost hypnotic cadence. Again, try to refrain your feet from stomping! This album is also a good test for vocals. You shouldn't expect the quality you can hear on modern audiophile recordings (which are more real than real, actually) but there should be NO trace of harshness or distortion, even during choirs. Voices should come out natural and easy on the ear. Actually, the whole album should sound easy, it's something you should be able to listen many times in a row (being 35 minutes long, that's not difficult!). Overall dynamics isn't anywhere near the best today's recordings so don't expect goose bumps in this specific department. This relaxed atmosphere makes the album even easier to enjoy. Finally, 3D soundstaging, being Pretzel logic a 1974 pop/rock recording, isn't impressive. Width, height and depth of the virtual are clearly limited. Not the same applies to focus and precision, which are quite good even by today's standards. This album is so entertaining that you'll forget being an audiophile, too. If your system can swing and time well you'll be amazed and you'll easily forget this record is just...34 years old.